I learned how to make egg salad in seriously large quantities when I worked in my friend Colleen’s cafe several years ago. Her egg salad recipe was the simplest I’d ever seen and I’m still amazed at how many egg salad sandwiches were ordered. It goes to show that often with cooking, as with life, simple is best. Since going back to Weight Watchers, I’ve played with my egg salad recipe a bit, using part plain non-fat Greek yogurt for part of the light mayonnaise. According to my calculations, each serving has 121 calories, *3 Weight Watchers PointsPlus, *3 Weight Watchers SmartPoints. 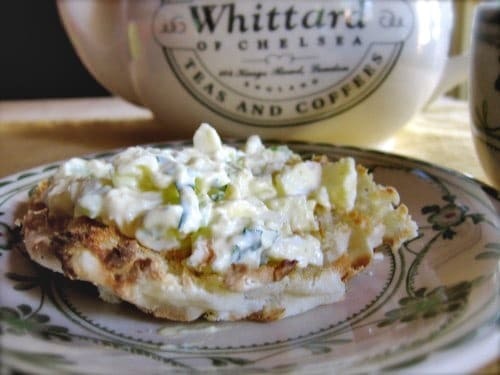 This easy egg salad is now 1 *SmartPoint on the new WW Freestyle Program! Spread this on your favorite, bread, toast, or cracker for a simple satisfying breakfast, lunch, or snack. It’s delicious stuffed into a tomato or lettuce wrap or dolloped onto cumber slices too. If you like drier egg salad, use less mayonnaise and/or yogurt. If you like more mayonnaise or yogurt, add it. This is a simple and old-fashioned egg salad recipe that can be enjoyed as written or embellished as you like. Egg Salad with Bacon – Omit salt. Add 2 tablespoons chopped bacon or real bacon bits. Curried Egg Salad – Omit salt. Add 1-1/2 teaspoons curry powder. Mediterranean Egg Salad – Omit Salt. Add 1 small minced garlic clove, 2 tablespoons chopped capers, and 1 minced anchovy fillet. Smoked Salmon Egg Salad – Add 2 ounces diced smoked salmon and 1 tablespoon chopped fresh dill. If you’ve made this egg salad, please give the recipe a star (?) rating below and leave a comment letting me know how you liked it. 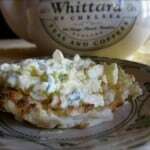 A simple and delicious easy egg salad recipe you can modify lots of ways. In a medium bowl, mix all ingredients (along with any optional additions), until well blended. Sources: Learning to Cook with Marion Cunningham, The New Basics Cookbook, The New Best Recipe: All-New Edition from the Editors of Cooks Illustrated. this is my fave recipe Martha…and i can have it with just anything..we make some Indian versions too..